When Meeting a High Demand For Coffee Is a Priority, Try Our Dependable & Sophisticated Commercial Brewers. The decanter brewer is the traditional coffee brewing system. It is easy to use and easy to clean. Able to brew multiple cups at one time, it is good for a high traffic environment and is a highly economic choice. 3-Burner models incorporate unique design features that include: a water level detection system that eliminates evaporation short pots, an adjustable brew safety light whcih flashes during the brew cycle to alert the user the brew cycle is in process, and a gravity hot water facuet system which dipsenses hot water while brewing without altering the brew volume. All the features are built into a stainless steel cabinet for long stability and durability. VERSATILE PLUMBING Traditionally used as a plumbed-in unit, but also has pour-over capability, in a pinch. HOT WATER FAUCET - can be used without affecting an ongoing brew cycle, for soup, tea, or cocoa. INDEPENDENT HOT PLATES which can be independently shut off, or used to keep up to three different pots of coffee warm at once. 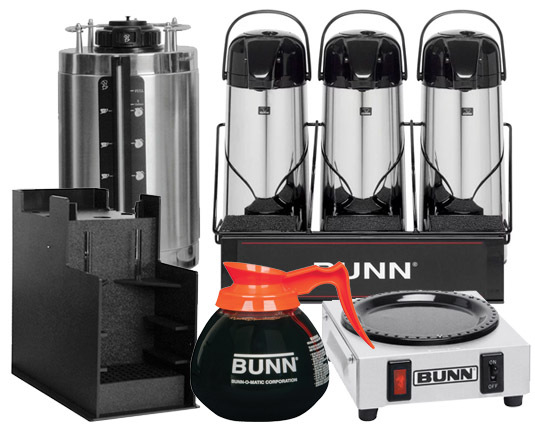 Airpots from Bunn, Bloomfield and Newco brew 3.9 to 6.8 gallons of perfect coffee per hour. Brews directly into airpots ranging from 1.9 to 3 liters. Convenient airpots keep coffee hot and fresh for hours and are easily transported to remote meeting rooms, breakfast bars, etc. Airpot models incorporate unique design features that include: a water level detection system that eliminates evaporation short pots, an adjustable brew safety light whcih flashes during the brew cycle to alert the user the brew cycle is in process, and a gravity hot water facuet system which dipsenses hot water while brewing without altering the brew volume. All the features are built into a stainless steel cabinet for long stability and durability. Global Vending Serbice carries airpot brewers that fit under most counter-top cabinets. Ready light indicates optimum brew temperature achieved; Blinking brew light alerts user that coffee is brewing; Universal base for perfect dispenser alignment; Gravity fed Hot Water Faucet for tea and soups; Tank "ON/OFF" switch; Pulse Brewing Option; Auto Arm Capable. ALWAYS A HOT CUP Each airpot can keep coffee hot and fresh for several hours. ALWAYS A FRESH CUP Airpots eliminate the need for hot plates to maintain brewed coffee's temperature, prolonging its freshness. PORTABLE Since an airpot does not need a warmer, the airpot can be taken to where it will be used. It can sit on practically any surface. The Satellite is a drip coffee system that brews into a 1.5 gallon dispenser that can be used as a satellite server. The double-wall insulated server can function with or without a heated satellite docking station, which keeps the coffee hot for serving, while freeing up the brewer to make additional batches of coffee. The one-touch preset brew buttons can be programmed with a range of brewing specifications, including pulse brew and pre-infusion options. The satellite dispenser features a Safety-Fresh brew-through lid, and a funnel equipped with Splash Guard to prevent spills and burns. The brewer includes a hot water faucet for soup, tea, and cocoa, which can be used without affecting the brew cycle. 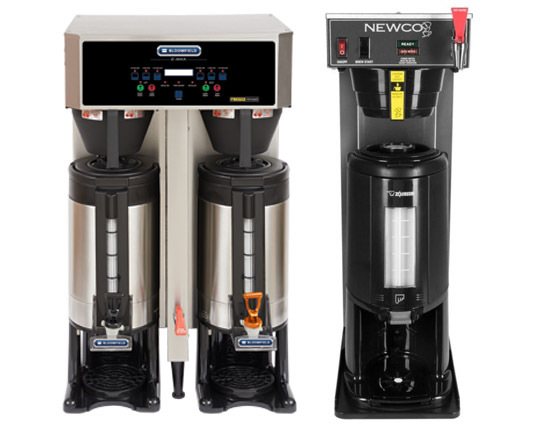 Satellite drip brewer systems are typically designed for high volume restaurant and institutional settings. Satellite dispensers generally have some insulation but are designed to sit on a warmer, unlike thermal dispensers. BATCH BREWING The double-wall insulated server can function with or without a satellite docking station while freeing up the brewer to make additional batches of coffee. HIGH VOLUME HOT WATER FAUCET - can be used without affecting an ongoing brew cycle, for soup, tea, or cocoa. CONSISTENLY GOOD Provides gourmet coffee control with Pre-Infusion, Pulse Brewing, Water Bypass and more. No manual adjustments needed. 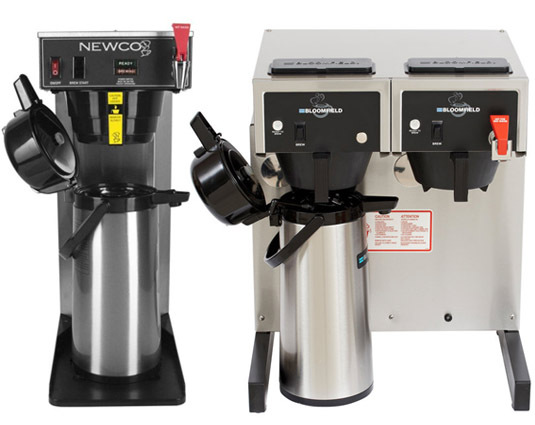 Thermal brewers are drip coffee brewers with single or twin thermal dispensers. Today's thermal brewers have Digital Control Modules and user-friendly LCD interfaces that gives the user full control over all aspects of the brew. The one-touch preset brew buttons can be programmed with a range of brewing specifications, including pulse brew and pre-infusion options. Thermal brewers brew directly into one or two 1.5 gallon thermal dispensers (other size dispensers available). 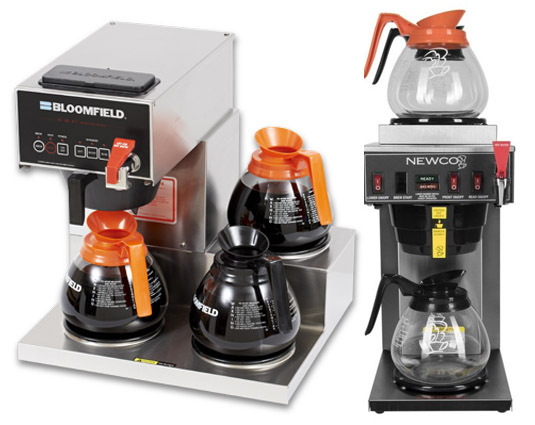 These portable dispensers are vacuum sealed with brew-through tops, allowing them to keep their contents hot and fresh for several hours, without a power source. They also feature a hot water faucet for tea, soup, and cocoa. 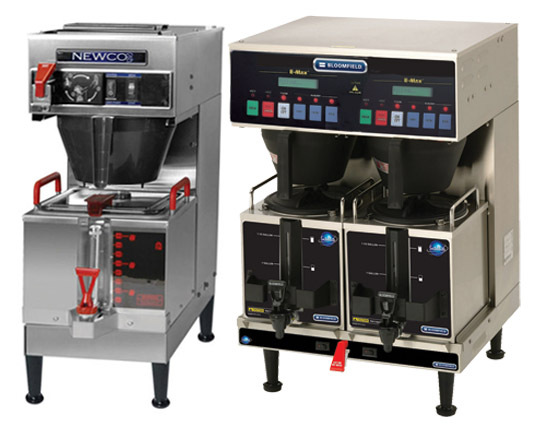 Thermal brewers are a modification of the traditional drip coffee brewer. By using an insulated dispenser, brewed coffee can be kept hot and fresh for several hours, without the need for a hot plate. REQUIRES NO PLUMBING – completely portable; just pour cold water in top and coffee brews immediately! RUGGED CONSTRUCTION - means years and years of use, and the brushed stainless steel exteriors are really stylish. NO STALE COFFEE Keeps coffee hot for hours through insulation without compromising the flavor. Everything you need to ensure your coffee can be enjoyed, from stands for condiments to thermals.